When you’re on a hen weekend, a sure fire way to get everyone giggling, and breaking the ice is with some fun hen party games. Whether it’s a few games during dinner, over a couple of drinks whilst hitting the bars, or when the prosecco’s flowing in your ‘hen house’ on a Friday night, they’re a fab activity for everyone to get stuck in with! 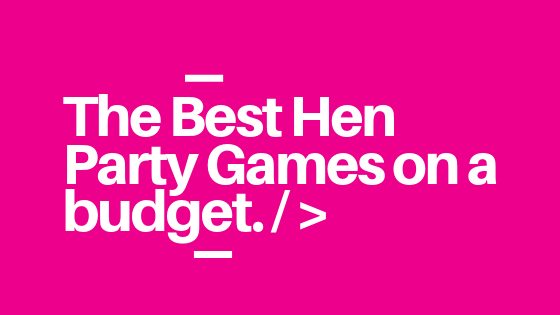 We’ve compiled a list of our favourite hen party games, all of which you can do whilst sticking to a hen party budget. So….ready, steady…..get playing! A hen party classic, and for good reason! Before the hen party, get personal with the groom, and ask him a series of questions ‘Mr and Mrs’ style, e.g. ‘What’s (brides name)’s worst habit?, What’s your favourite body part?, Who’s her celebrity crush?’. How creative and cheeky you get is completely up to you! You can either get the groom to write all his answers down, or if you wanted to create the full ‘Mr and Mrs’ Experience, you could interview him in person, and film all his responses to play back to the bride! A guaranteed giggle. Print out (or even draw) a large picture of either a hunky celebrity (think Ryan Gosling, Idris Elba), or even the hen’s hubbie to be, and like in the classic game of ‘pin the tail on the donkey’, take it in turns to blindfold each other, and pin the ‘tail’ (or ‘aubergine/pants….how cheeky you go is completely up to you!) on the hunk. The closest pin gets a prize! *make it even more challenging by giving everyone a little spin around before they ‘pin the tail’ – although after a few G&T’s spinning might not be necessary! Perfect for during pre drinks. Split into teams, with the bride being the judge of the competition, and work together as a team to make the bride a cocktail of your own creation. Whether you want to go sophisticated, strong, or just completely bonkers/out there, it’s completely up to you! The bride (not knowing who’s is who’s creation), judges her favourite, and picks the winning (and losing) team! You could add a few rounds to this game if you wanted to stretch it out and continue the fun! You could have a shots round (where you create your very own shot for the bride), a ‘prosecco’ cocktails round, gin based round, rum based round etc! One last layer you could add to the game is to test the bride out and have her guess what’s in each cocktail! If she gets the ingredients wrong, she has to down the drink! A fun challenge for over dinner or a few drinks! Before the hen party, write out a quiz sheet for all the hen’s, with questions about the bride (again, you can get as cheeky as you like, or stay on the straight and narrow with these questions! ), print off a load of copies, and hand them out to everyone in the group to fill in. Collect them in, and tot up the scores. Winner gets a prize, and loser has to do a forfeit, or hen party dare! Useful and entertaining. Before the hen, tell everyone to, in secret, but a pair of pants/underwear for the bride, so she can start off her new married life with a fully stocked up set of drawers! As you give them one by one, she has to try and guess who they’re from – you could even add a little note with a cryptic clue to help her out. In teams, or as individual ‘artists’, give everyone a pot of playdough, and set everyone a naughty ‘playdough sculpture’ challenge, and make the bride a naughty little gallery! How risqué you want to go is completely up to you…..
You can either judge the winner with votes on the best sculpture, or have the bride guess who’s piece of art belongs to who! A brilliant budget hen party game – all you need is some playdough, and for everyone to get stuck in and have a giggle! You’ll be surprised on how competitive this can get very quickly…. You could even get some little paint pots/brushes or glitter involved to really jazz up your um….’creations’! Whilst you can book hen party scavenger hunt’s as an official hen party activity, if you’re on a budget for a hen weekend, you can absolutely create your own too! You could split the group into teams and hand out some lists for items to collect over the course of the day, or give everyone an allotted time to go, go, go and collect as many items as fast as you can! A brilliant way to explore the city you’re in for a hen do, and to really get creative with some challenges. If you don’t want to do an ‘items collection’ scavenger hunt, you could do a ‘pictures challenge’, where you write a list of hilarious pictures the teams have to try and get over the course of the afternoon! Decide at the start of the hen on a series of words that the bride is ‘banned’ from saying throughout the day (popular hen words like ‘wedding’, ‘hen’ or her husbands name are all good starters!). If she’s caught saying any of the words over the course of the day….you know what that means: Bridal Forfeit!!! You could extend this to the rest of the party, and have a forfeit for ANYONE in the group who says any of these words over a period of time! A fun, sentimental game for the hen. Ask everyone to bring a little gift to the hen party that reminds them of the bride or represents a special memory they have together. It can be funny, meaningful, or cheeky. The bride opens each gift one by one, and has to guess who gave each gift, and explain what memory it is that each present represents! An absolute hen weekend classic! Split into teams, and with an allotted amount of time, and a roll or two of toilet paper each, pick a ‘model’ for each team and create a gorgeous ‘dress’ made just out of….you guessed it, toilet paper! The bride (or an impartial judge!) picks the best creation. You could even have a ‘catwalk’ with all of the dresses, and a photoshoot of all the models in their gowns! Again, a good one for over dinner whilst everyone’s sat around the table! Hand out a paper and pen to all the members of the group, and get everyone to write down their number one tip for a successful marriage for the bride. It can be meaningful, silly, or downright naughty (careful of the mother in law’s ears!). Everyone has to stand up, and present their wisdom to the bride, and hand her the tip to take away with her. A good giggle, and who knows….maybe there will even be one or two useful tips in there! An oldie, but a goodie, and a guaranteed way to break the ice and have everyone getting to know each other! Grab some drinks and start getting to know everyone’s risqué secrets before the big weekend! Perfect for pre-drinks. Like the American ‘beer pong’, you can get some ping pong balls, and prosecco, and get playing ‘Prosecco pong’ with the rest of the hens! You can either buy premade ‘prosecco pong’ sets online, or, if you’re trying to save some pennies…make your own! Bra Pong is another fun option for the game, where you can replace the prosecco filled cups with some bras. Work out a scoring system and get the ping pong balls in the bras! We hope that’s given you a good idea of some fun hen party games, that are a guaranteed giggle, and a failsafe way to kick off a hen weekend.